The Poly-Ond® coating provides exceptional lubricity, with a coefficient of friction of .06 when measured with a 200-pound kinetic load. Polymer resins are infused throughout the thickness of the Poly-Ond® coating, providing continued dry lubricity, even after commencement of surface wear. Poly-Ond’s® dry lubricity eliminates product contamination problems common with liquid lubricants. Poly-Ond® has been approved by the United States Department of Agriculture, so it can have direct contact with food. Unlike liquid lubricants that solidify at low temperatures, Poly-Ond® performs consistently across a wide temperature range. 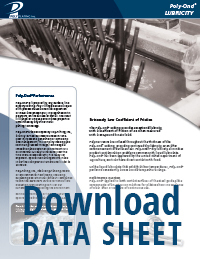 Poly-Ond® applied to both contact surfaces of the steel guide plate components of an extrusion machine for plastics shows no evidence of wear after 3 1/2 years of continuous use.